Jane Clarke's first collection, The River, was published by Bloodaxe Books in 2015. Her second collection, When the Tree Falls, will be published by Bloodaxe Books in September 2019. All the Way Home, an illustrated sequence of poems in response to a family archive of First World War photographs and letters held in the Mary Evans Picture Library, London, was published by Smith|Doorstop in April 2019. Originally from a farm in Roscommon, Jane now lives in Glenmalure, Co. Wicklow. In 2016 she won the Hennessy Literary Award for Emerging Poetry with three poems from The River. She also won the inaugural Listowel Writers' Week Poem of the Year at the Irish Book Awards. The River was shortlisted for the Royal Society for Literature Ondaatje Award, given for a distinguished work of fiction or non-fiction evoking the spirit of a place. Jane gratefully acknowledges the Arts Council Literature Bursary Award in 2017, Wicklow County Council Artist Support Award 2019 and Culture Ireland support for readings in the UK and US. 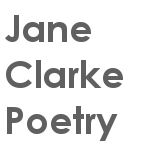 Clear, direct, lovely: Jane Clarke’s voice slips into the Irish tradition with such ease, it is as though she had always been at the heart of it. – Anne Enright, Laureate for Irish Fiction. Jane reads and talks about her poem ’Swim’ from When the Tree Falls, celebrating her friendship with fellow poet Shirley McClure, who died from cancer in 2016.